Outlaw or lawman…the mustache will reveal the truth! “When Baby Billy was born, his family noticed something odd: / He had a mustache.” When they ask the nurse what it could mean, she answers that they’ll have to wait to “see whether it turns out to be a good-guy mustache or a bad-guy mustache.” At first, Billy’s a cowboy, protecting his cattle (teddy bear) from attack (by the family dog) and caring for injured animals (his torn bear). Obviously a good-guy mustache! He becomes a “ringleader. A Spanish painter. A sword fighter. And finally… / A man of the law.” But as he grows into toddlerhood, his mustache begins to curl at the ends and becomes a bad-guy mustache! After some cat burglary, “cereal” crime and train robbery (including the track), he’s caught and thrown in jail (a barred crib). After ages, his mother busts him out, and his parents explain that everyone has “a bad-mustache day” every once in a while. Heos’ simple and silly metaphorical tale of the terrible twos will definitely entertain parents and children older than Billy. 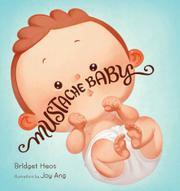 Twos will, at least, giggle over every page of the digitally created, jewel-eyed, cartoon illustrations, with their mix of Saturday-morning slapstick, dramatic comic-book angles and mustachioed babies.